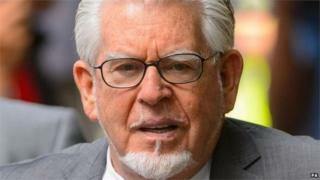 A song penned by Rolf Harris in prison shows he "still doesn't care", one of his victims has said. Karen Gardner, who was assaulted by the star in 1977 when she was 16, said Harris had still not taken responsibility for his crimes. In the song - contained in a letter written to a friend and given to a newspaper - Harris seems to refer to his victims as "slimy little woodworm". Harris was jailed last year for 12 indecent assaults against four girls. The 85-year-old was sentenced to five years and nine months for the crimes, which took place between 1968 and 1986, and is understood to be serving his sentence at Stafford prison. Harris wrote a letter to someone close to him containing lyrics to a new song, which he said he planned to record once he was released. The letter was then passed to the Mail on Sunday. According to the Mail, one line of the song, which Harris said he would like to set to country rock music, reads: "Perhaps you believe you're pretty still, some perfumed sultry wench?" Other lines say: "Make him burn, get your 50-year-old hooks into his dough. "Make him burn, burn, burn. Come and join the feeding frenzy, girls." Ms Gardner, whose written evidence was used by the prosecution, told the BBC she was angry that after a year in prison, Harris "still didn't get it". She said he was a "sexual predator" and was still trying to make himself feel "big and strong" when he was actually "a pathetic, disgraced old man in prison". "He used his hands and his words to damage young women," she said. "It was sexual, it was about power, but he didn't leave any physical evidence, and that's what men like that do." Ms Gardner, who works for BBC Wiltshire, said she was "less harmed" than most of the girls and she can remember "that his aftershave smelled of spice, that his breath smelled of menthol, that his hands were so sweaty they stained my jeans". One of the most upsetting things about the letter were the comments from people who still supported him, she told BBC Radio 4's Today programme. "If he had caused physical damage, if he'd bruised us or broken our limbs, nobody would question that he should be punished 40 years later," she said. "Because he didn't leave physical evidence, they think somehow it wasn't as bad. Yet what he did was damage young women's self-worth, their confidence and, for some of those women, he affected them deeply for the rest of their lives." Harris was unanimously found guilty of molesting four girls, including one woman who was just seven or eight at the time and was groped when she asked for his autograph. The judge, Mr Justice Sweeney, said Harris had taken advantage of his celebrity status and had shown "no remorse". The veteran presenter had his CBE annulled at the order of the Queen following his conviction.